Crestwood is a residential community of green lawns, towering houses and quiet streets nestled between 16th Street and Rock Creek Park in the northwest quadrant of Washington, DC. 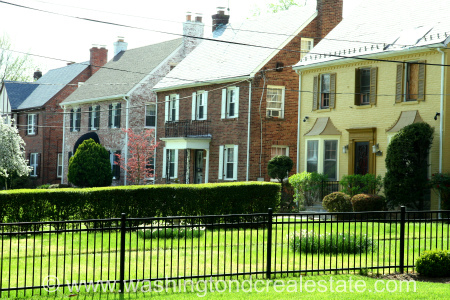 Crestwood is part of the affluent area on upper 16th Street, NW, once known as the “Gold Coast” for its educated and affluent black population. Crestwood was originally a large 300-acre estate in the 18th Century before it was developed into single-family homes. Because there is no through traffic, Crestwood is distinguished by the fact that it is much quieter than adjoining neighborhoods. Adding to the aura of serenity, many of the homes are set back on large plots of land and range from brick colonials to large Tudors and expansive ranch homes. Crestwood is not served by a Metro Station but the Petworth and Columbia Heights stations are within walking distance. The multiple bus lines running up and down 16th Street are also popular options and residents cite easy commuting access to Silver Spring, Bethesda, and downtown DC. Crestwood borders Rock Creek Park on three sides as well as upper 16th Street.